The big day is finally here-reveal day!! 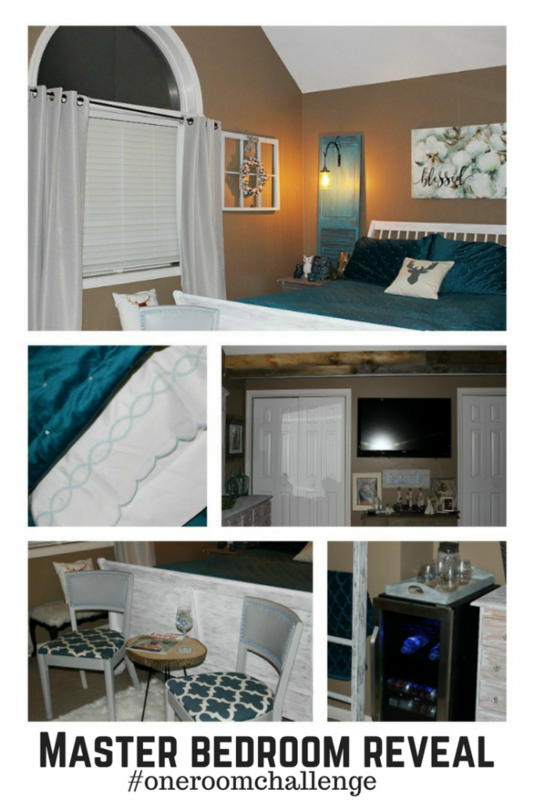 I am so excited to share with you the entire master bedroom retreat makeover. It has been tough for me to keep this under wraps because I was so happy with how it turned out, I wanted to share it immediately! If you are not familiar with the ORC, it is organized by Linda at Calling It Home and sponsored by House Beautiful. It is a biannual event every April and October where 20 bloggers are invited to makeover a space from start to finish in under 6 weeks. You can also participate as a guest participant, which is what I did. 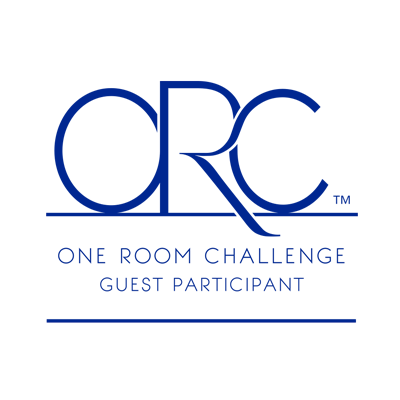 When you are working on a challenge-it is exactly that-a challenge. So, there are ultimately going to be some things that have to be changed. Here is what I accomplished in this space in just 6 weeks. 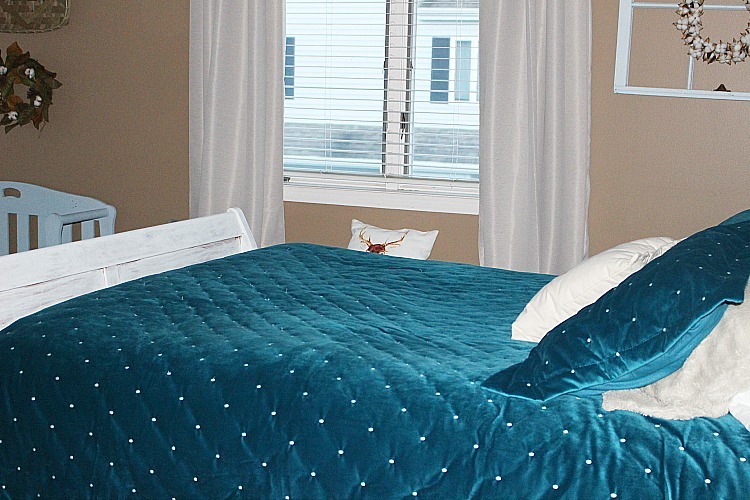 The gorgeous velvet blue bedding really adds the pop of color I was looking for and it really is as luxurious as it looks. You can read all about the bedding from QE Home | Quilts Etc. in Week 6 here. Now you can’t have a master retreat without having luxurious sheets. 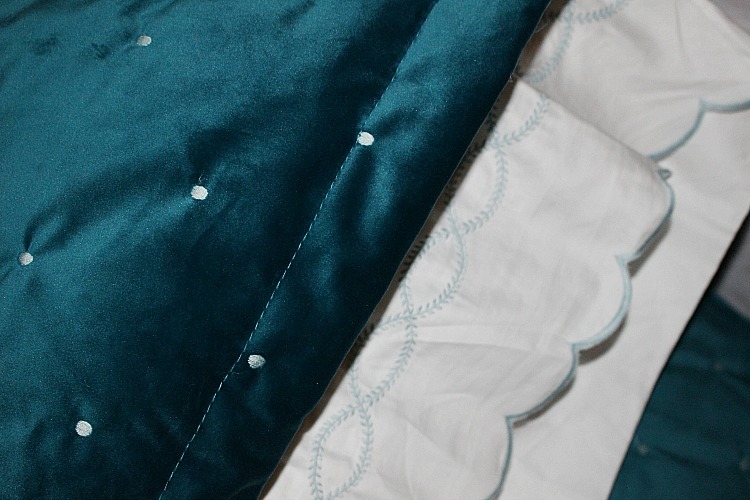 These scalloped edge sheets are the softest sheets I’ve ever slept on! 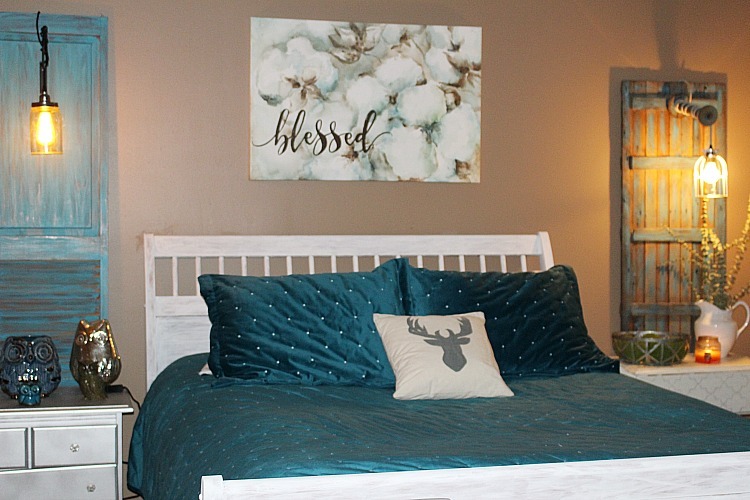 They are from Perfect Linens and were shared in Week 2 here. The blessed sign really set the stage for the look I was going for. It is from Tre Sorelle Studios and is a Watercolor cotton boll painting that I shared in Week 5 here. 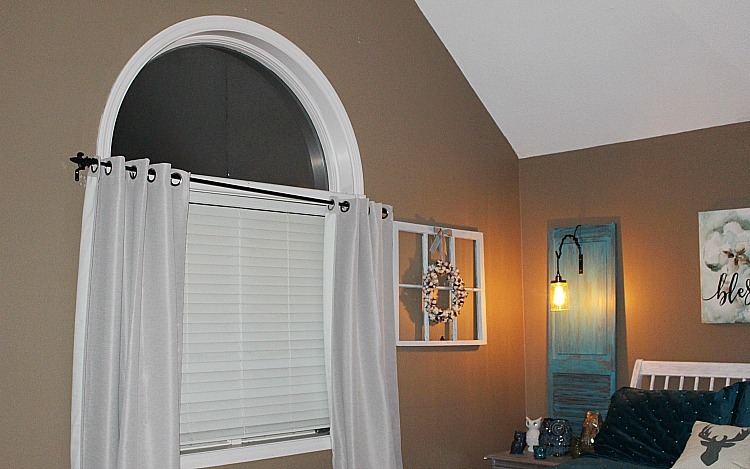 The DIY Hanging light fixture can be found in Week 4 here. 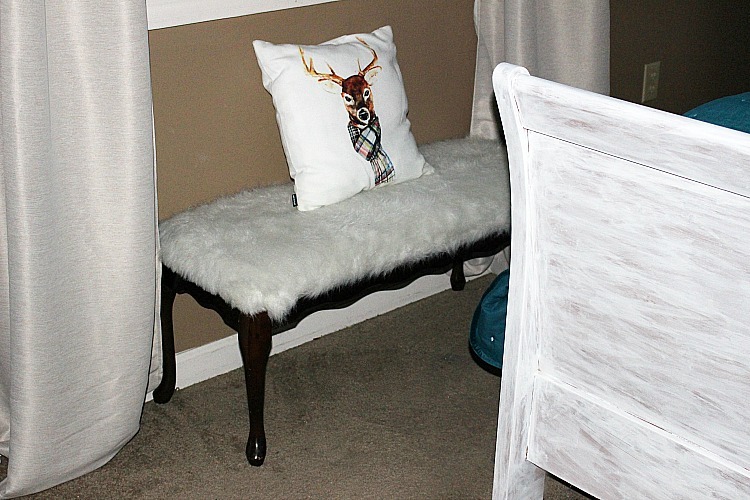 This faux fur bench fits perfectly in front of the window. 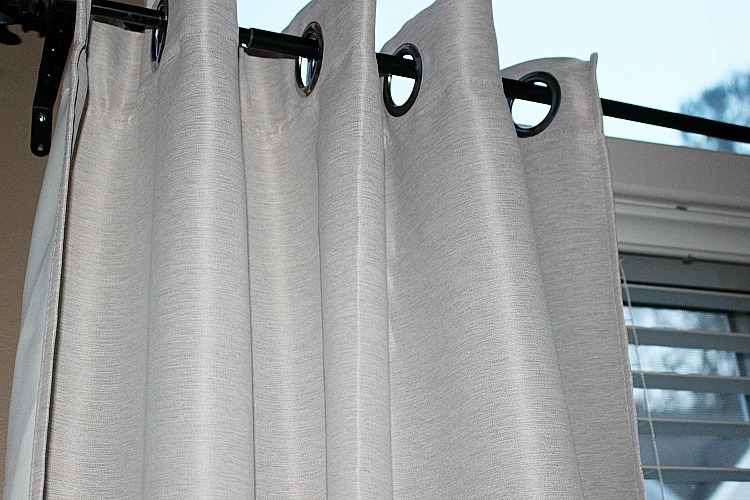 The grommet curtains are black out curtains and are a very warm neutral shade. They are from Subrtex and they really look so much better than the thin blue curtains I had previously. 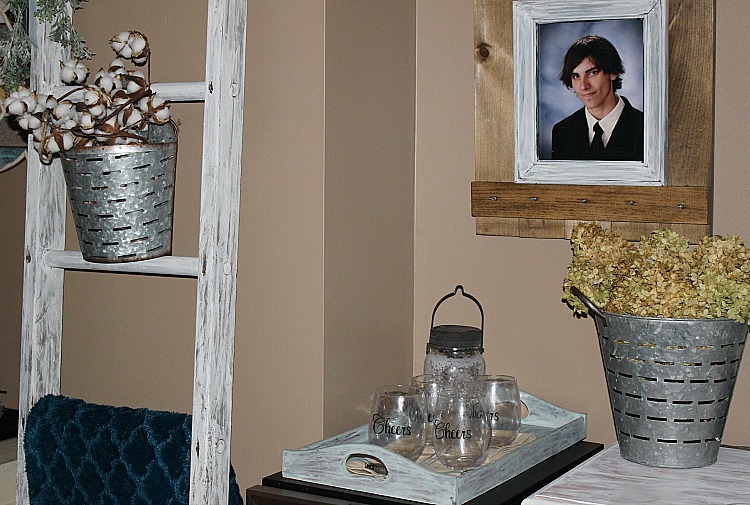 The DIY Rustic Frames my Dad made me are a nice contrast to the whitewash furniture and tie in the DIY Wood Beams. You can get a tutorial for the frames shared in Week 5 here. The dresser received all new hardware from D. Lawless Hardware. You can read about it in Week 3 here. The vintage ladder was a $5 find from my Dad. I talk about decorating with ladders here. 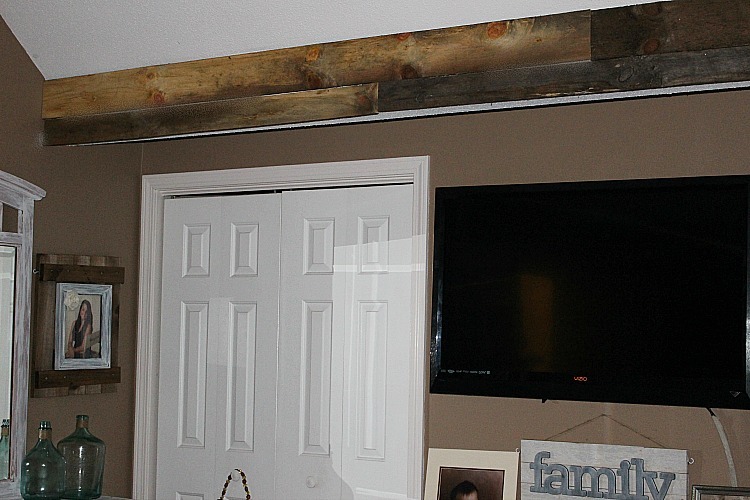 The barn wood beam adds a rustic element to the room and covers up the white beam that was there previously. I can’t wait to decorate it for Christmas with garland. I probably should just enjoy it before I decorate it right? 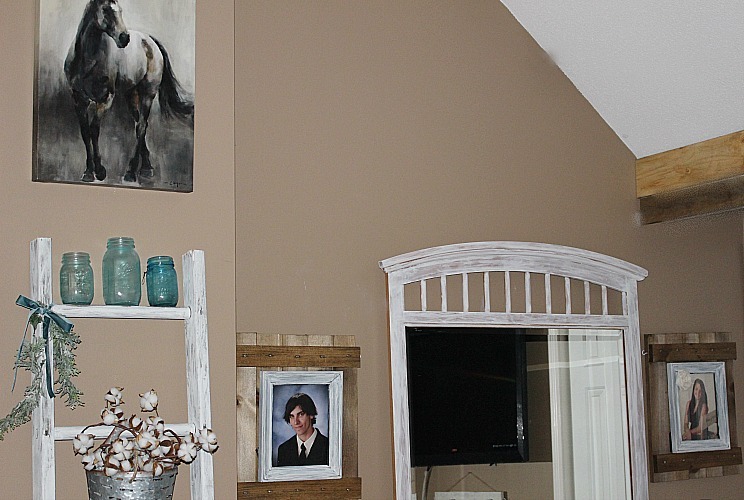 The barn wood definitely adds a lot of interest to the room. I would absolutely love to put the cross beams on the peak of the vaulted ceiling. Wouldn’t that be cool? 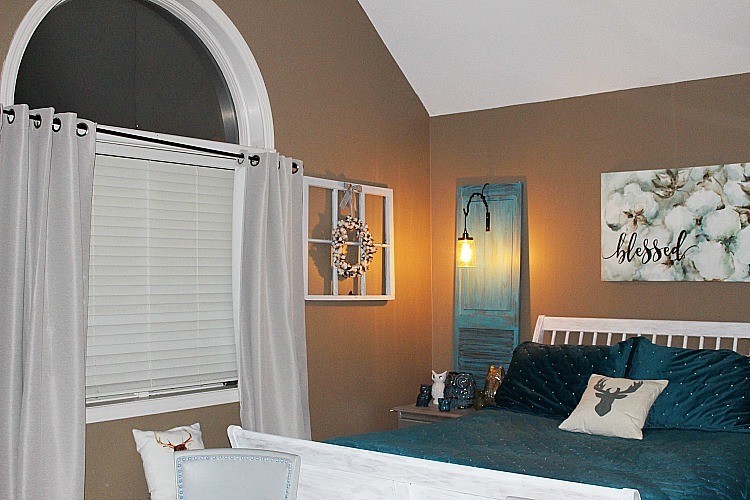 The half moon window is one of my favorite things in the room. I can lie in bed and see the moon at night. It’s pretty sweet. 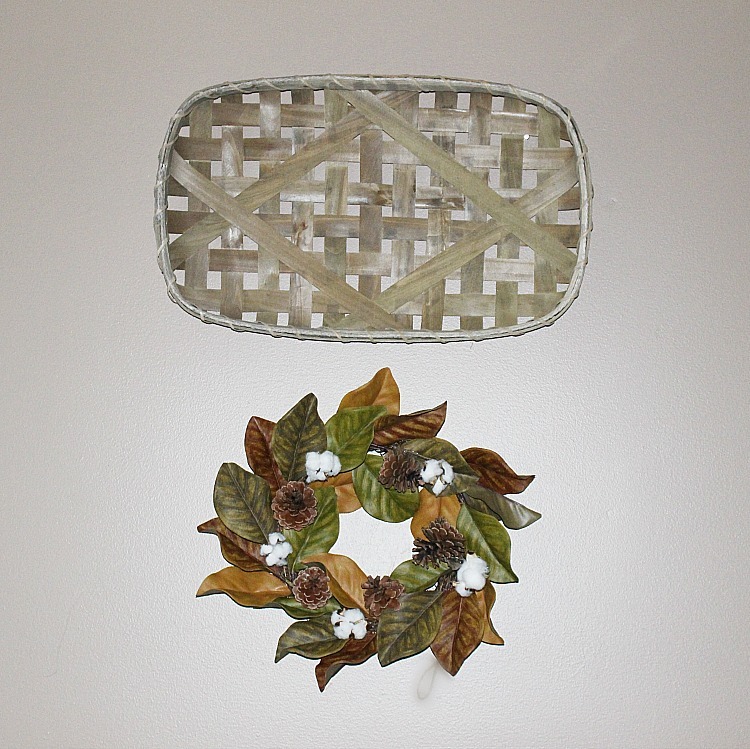 The tobacco basket and wreath add to the farmhouse touch I like. OK. This is a little over the top I know. But, why shouldn’t I have a wine refrigerator in my master bedroom retreat? I had this in the kitchen and my Son moved it upstairs for me. It really is convenient to grab a water bottle at night or have a glass of wine. Speaking of wine, my new spot to relax with my favorite Fabulous at 50 wine glass that I received as a gift and my new sitting area. 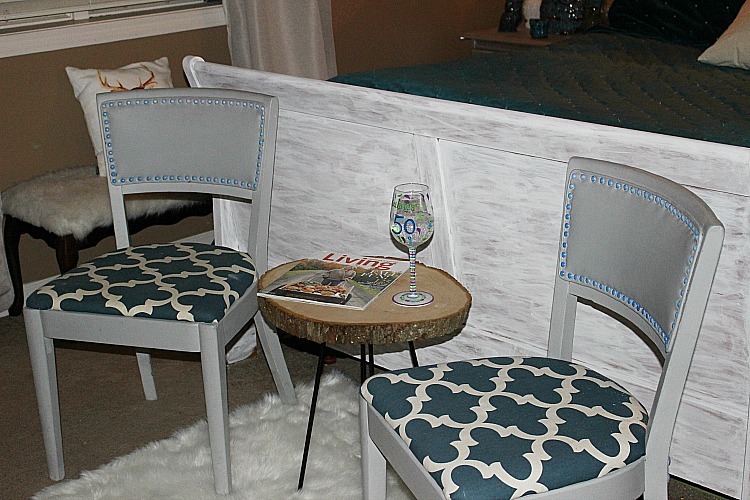 The fabric on the chairs is the perfect shade of blue! Fresh eucalyptus from Trader Joe’s and a scented candle finish the master bedroom retreat. I would like to thank my wonderful sponsors who really made the room come together. This has been such a great time. I was able to get to know so many bloggers and really learned a lot! 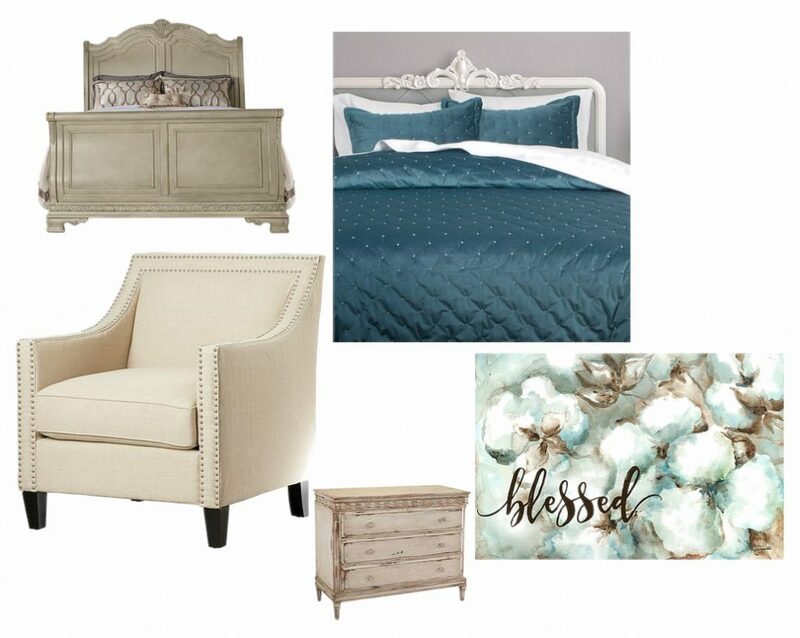 Hopefully I will take on the guest bedroom in the Spring! Your room is so tranquil and relaxing and I love the bedding! Great job on the space! I agree, who wouldn’t want a wine fridge in their master retreat!? : ) Such a lovely space to relax and get away from the hustle and bustle. The color of your bedding is so pretty and the scalloped sheets are wonderful! Enjoy your space and great job! What a gorgeous reveal! I love love love that bedding! So beautiful – congrats! 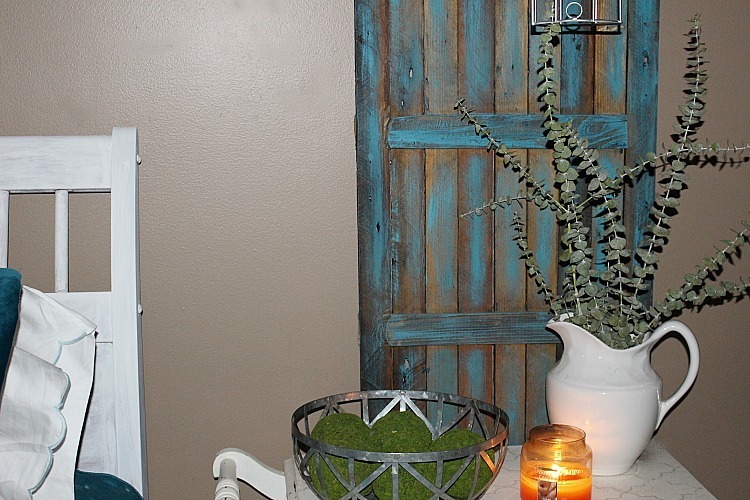 Jen @ Noting Grace recently posted…Vintage Farmhouse Powder Room – for less than $500! I am loving the idea of a wine fridge in the bedroom…seems decadent. Beautiful reveal here. I have enjoyed following your progress! Your room looks wonderful Michelle!! And wine in the bedroom….but of course 🙂 It has been fun doing this challenge for the first time with you, we made it!!! 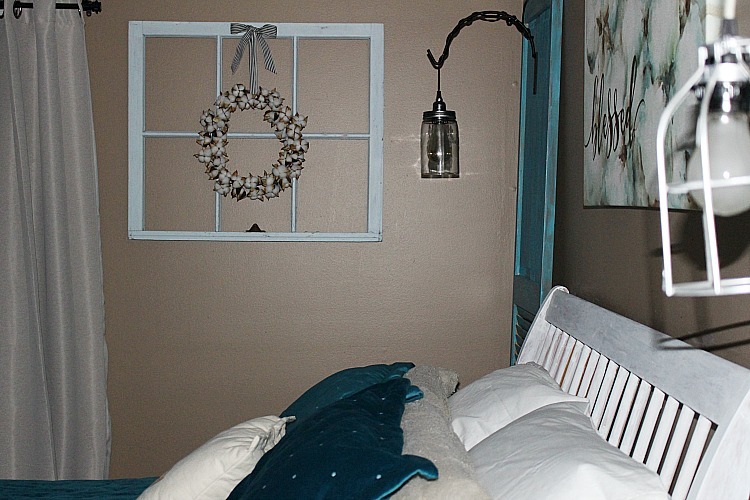 Michelle, what a warm, cozy, and relaxing retreat you’ve created! The colors are so pretty, I love the added texture the faux wood beam brings into the space! Finally, the icing on the cake, the wine fridge addition! I think I may just have to bring mine up to my room too, I love that idea!!! Enjoy your new retreat! The wine frig is over the top but really awesome!! 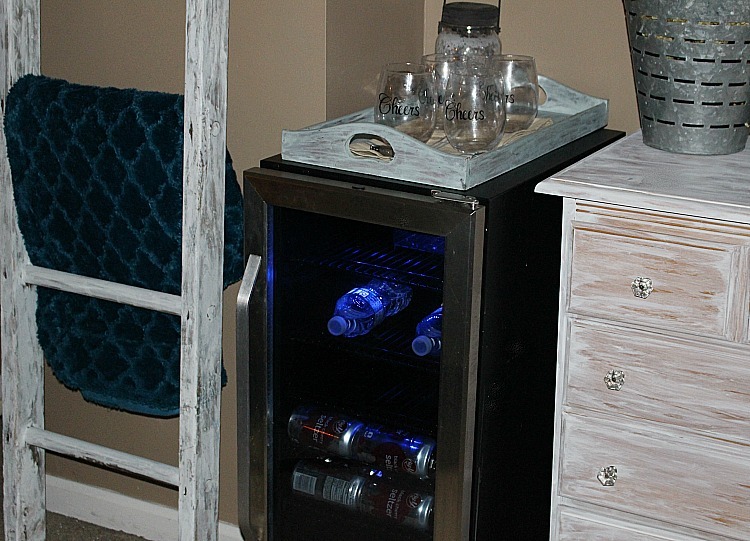 I love this and you are right….why not have a wine fridge in the master bedroom. It is awesome and I am thinking about moving mine upstairs. LOL! The entire room turned out amazing and beautiful. I am in love with that art work and the two side pieces with the light fixtures. I would love to join in on this one time to re-do our upstairs bath. Your room turned out just beautiful! It looks like such a lovely retreat. Great job! What a gorgeous room. I had a hard time picking my favorite part its all wonderful. It would be amazing to come to that room at days end. I actually have a wine fridge out in the garage unused, I love that you created a little space for it in your room. 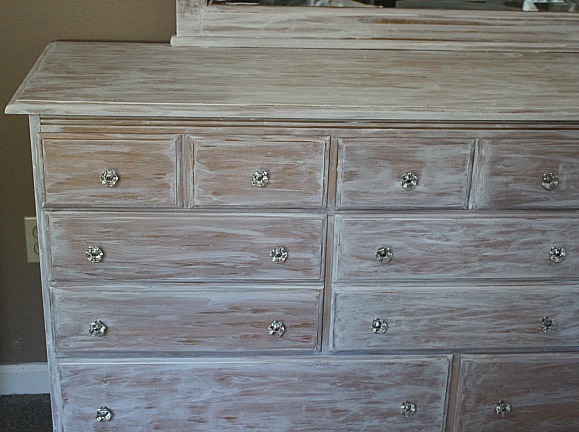 Congratulations on completing your first One Room Challenge and creating a lovely master bedroom retreat. I am first getting around now to going through the Fall 2017 Guest Participants. I am working on bedroom ideas right now and I love seeing what inspirations others had and how they implemented them. You accomplished so much! 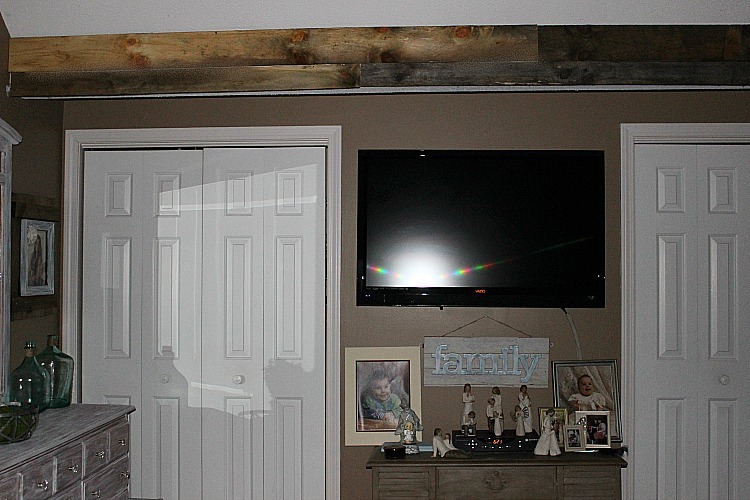 I especially like the whitewash finish you gave your furniture to refresh it and the barnwood treatment on the beam. The velvet bedding is also scrumptious. If I had such bedding I would probably rarely get out of bed! And the wine fridge! Divine inspiration, I swear.